UPDATE 8/23/18: Jenny is on the road to recovery! Her ear infection is under control, she has gained 2 pounds of the 10 she lost, and she is eating with gusto! :))) She will be released from hospital care as soon as we find her a forever home. UPDATE 8-13-18: Jenny’s “head tilt” only lasted a few days – thank heavens. She is still unsteady on her feet. This past weekend we thought she might need plasma – but so far it’s not necessary. The nystagmus (a vision condition in which the eyes make repetitive, uncontrolled movements) seems to have stopped. Currently she is not eating and has constant diarrhea – so we’re trying to get her to eat (anything she wants) and get a handle on her bodily functions. Our vet still thinks all this stems from her incredibly bad ear infection – which is being treated with a vengeance. Thank you to all who have donated (and sent prayers) to keep Jenny going. We’re hoping she will be looking for her forever home soon! We want Jenny to experience a life where she is loved and cherished and spoiled … do you want to be that lucky family? UPDATE 8/6/18 – We just received an update from Dr. Pam. Overnight Jenny took a turn for the worse and is suffering from the following symptoms: severe diarrhea, head tilt to the right, “neurological” stumbles and falls, and nystagmus (a vision condition in which the eyes make repetitive, uncontrolled movements). These things could be caused from her heart worms, her ear infections, or a stroke. 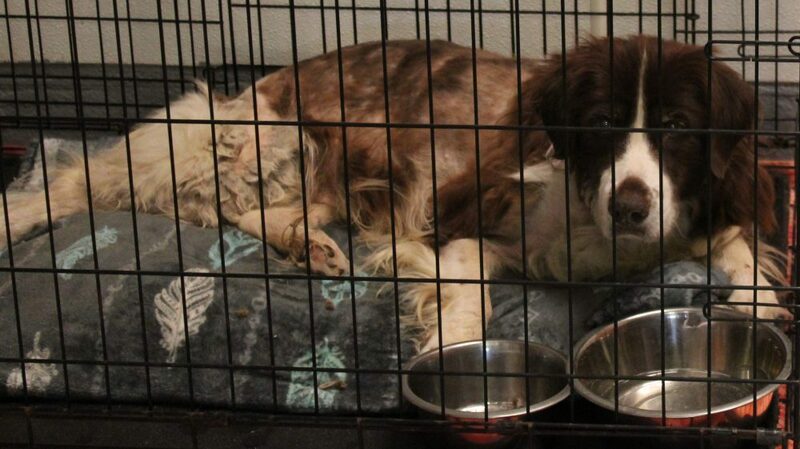 More in-depth tests are needed for sweet Jenny. Jenny is still in the vet hospital. She had her dental work done last week and her mouth is in better condition. She had her ears packed for the 2nd time and we’re hoping that the infection clears up soon. Despite the weakness in her back legs, but she is getting stronger every day! 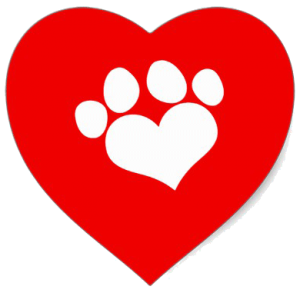 Thank you for your donations – they are helping us to pay for her care, but we still need more to cover her medical expenses. Can you help? 7/19/18 – Jenny was rescued by the granddaughter of an elderly man who has not been able to take care of her…for many years now! 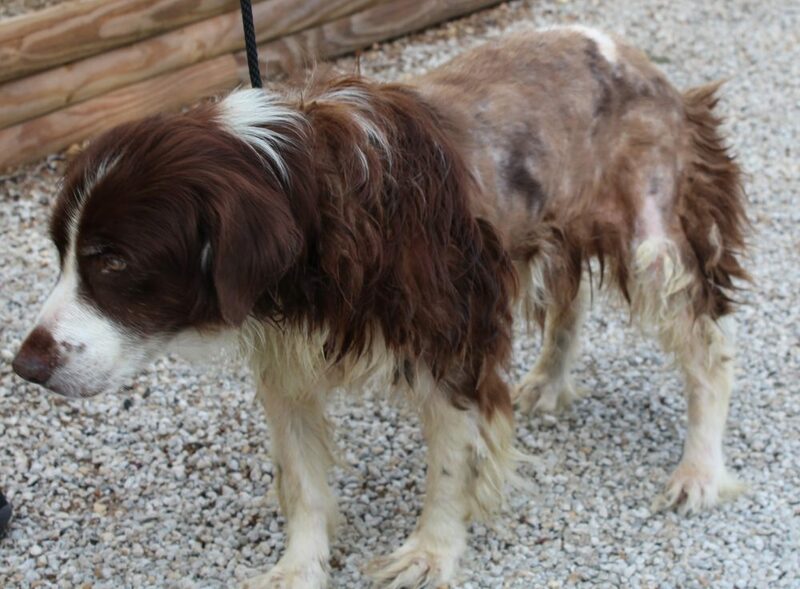 We have seen a lot in our years rescuing Brittanys but Jenny’s condition really shocked us. 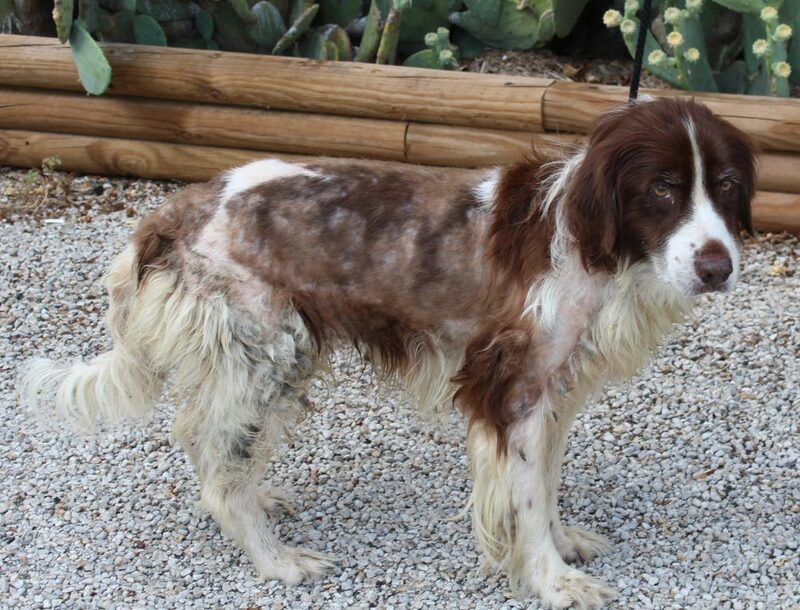 When we first met Jenny, her body reeked from all her issues…filthy skin, coat, teeth, ears, and mats. In addition to being seriously malnourished she also has heartworms. Her coat is in horrible shape from not being bathed in years. She is covered in mats….we’ve NEVER seen so many mats…literally mats on top of mats. Dr. Pam says Jenny has the worst ears she has seen in a long time – full of “goop” caused by her poor corn-based diet. Dental surgery is scheduled for tomorrow to remove her many rotted teeth. Jenny is going to need x-rays, tests, medication and hospital care. Despite her perilous condition….she is a sweet girl and Dr. Pam is confident that Jenny will pull through this and can have a happy life. 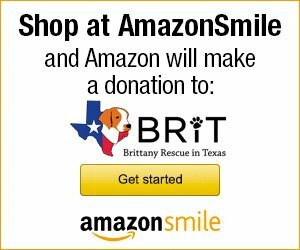 PLEASE be a BRIT SuperHero and help us give Jenny the life she deserves: SHARE Jenny’s story and make a donation today!